APEX Auto Spa NorthPark Center is Dallas, TX ultimate hand car wash and automotive customization facility offering the best hand-car wash in the DFW metroplex, automotive customization such as window tinting, paint protection films and ceramic coatings all installed while you shop, eat or take in a movie. APEX Auto Spa NorthPark Center is where the Art of the Hand-Car Wash meets the Art of Shopping. APEX Auto Spa NorthPark Center is located on the lower level of the West Garage just outside Nordstrom, along Boedeker Street. We are open 7 days a week, opening when the Center opens and closing roughly 2 hours before the Center closes for the day. APEX Auto Spa NorthPark Center offers the following services while you shop, eat or take in a movie; The Ultimate Hand-Car Wash, On-the-Go Auto Detailing Services, Complete Interior Cleaning and Detailing, Paint Protection Film, Ceramic Coatings, Window Tinting Services, Vinyl Vehicle Accents, Automotive Customization Products and Automotive Related Gift Sales. APEX Auto Spa NorthPark Center offers its clients the ultimate hand-car wash experience in the Metroplex. By employing steam and using a special washing method, coupled with the best professional and environmentally friendly cleaning products available, APEX Auto Spa NorthPark Center is able to completely and thoroughly clean the exterior and interior of your automobile unlike any other track or hand car wash. We guarantee our multi-step cleaning process, using only the finest products, tools and 100% South Korean Microfiber available will not scratch or micro-mar the finish of your vehicle. 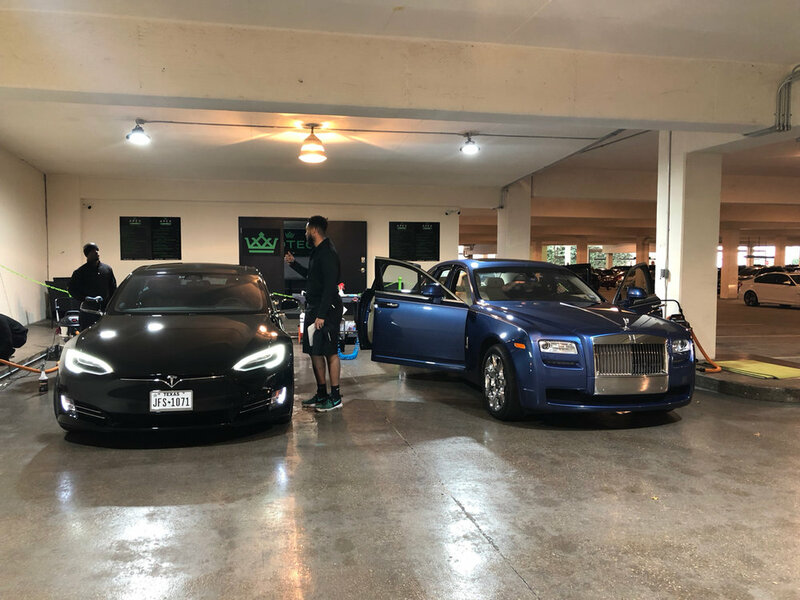 APEX Auto Spa is very familiar with modern day paint protection films (PPF/Clear Bra) and Ceramic Coatings as we are certified installers of both for the best PPF and Ceramic Coating products such as Ceramic Pro and Llumar Platinum PPF to name a few. Our methods will not harm either PPF or your ceramic coatings, in fact we employ steam to help aid in the self-healing capabilities of modern-day paint protection films. Steam is also a disinfectant and when employed on the interior/exterior of your vehicle will leave it germ free and disinfected! APEX Auto Spa NorthPark Center offers a good, better and best service level with everything we do from our Ultimate Hand-Car Wash to our Window Tinting and Ceramic Coating Services all while you enjoy the shopping, dining and movie going experiences that the NorthPark Center has to offer. With the Ultimate Hand-Car Wash starting at price points of $30, $40 and $60 APEX Auto Spa NorthPark Center is sure to have something within your budget. We invite you to come experinace DFW's ultimate hand-car wash yourself, because your car isn't clean until it's APEX clean!